I am Sianna White, a seventeen year old white belt of ten months at the Wyndham Academy of Self-Defense in Spartanburg, South Carolina. I am training in the art of Nihon Goshin Aikido: or known simply as NGA, which is a martial art designed specifically to protect the user and the opponent in whom the user is facing. Unlike many martial arts, Aikido uses grappling and the weaknesses of the human body to defeat attackers. In my months of training under Sensei John Wyndham, Aikido has allowed me to not only increase my physical strength, but also to strengthen my self-confidence, mental health, and overall well-being. Throughout my training in the dojo with Sensei Wyndham and fellow students, I have found that I thoroughly enjoyed the atmosphere and dedication in the Academy. As I continued to learn a multitude of self-defense techniques, I have found that my self-confidence has been strengthened. In the past, I was more or less quiet and soft spoken, but Sensei has taught me physical and mental strength through decision making and quick actions. The road has not been easy, however. Countless attempts with the same technique have heightened my focus and will to learn. Furthermore, over the course of my classes at Wyndham Academy, I have developed a sense of pride and self-confidence far greater than I had before beginning training. I also found that my abilities beyond my training, such as my classwork and memory have improved, and I have had significantly higher grades at school. I have also gained a sense of personal safety. As a senior in an early college environment, I come across many different people in my day to day travels, many of which are much older and intimidating than I. I used to be unsure around these people and found myself avoiding conversation and interaction. Now, I feel a sense of security in these situations with the idea that I could defend myself if any problems ever arose. Overall, I have found that taking classes at Wyndham Academy has changed my life for the better. I once had lunch at a sandwich shop in Spartanburg, and there was a flier on the table. I opened the flier without really considering what Aikido was. But the next section of the flier surprised me. Under a section headlined, “Who is Aikido for?” it described the training as being accessible to anyone, regardless of age and regardless of physicality. I was never picked first for dodgeball. I never made the football team. Or the basketball team. Or the soccer team. I’ve never been described as “someone you wouldn’t want to come face-to-face with in a dark alley.” “Maybe I could do this,” I thought. I called the school and spoke with Mr. Wyndham, the owner and Chief Instructor. He described in more detail the curriculum at the Academy and encouraged me to watch a class and ask questions of the instructors. I don’t think I blinked observing that first class. Students worked together in pairs, and I was amazed by how fluidly they moved. The advanced students seemed to glide, and with movements too quick and subtle for my untrained eye to see, they sent their partners flying away from them. Later that same class, I watched an advanced student working with a young man who had just signed up that day. Where the advanced student had been moving so fast before, he was now working slowly and patiently with his new partner. Since I was home from college on summer break, I was bored when I wasn’t at work and needed something to do. I told myself as I signed up that it was just to keep me occupied until I went back to school. I went into my first class a little nervous, but the friendly students and patient instructors welcomed me onto the mats. When I felt the first technique of the system as it was being taught to me for the first time, I had a moment of clarity. I realized this martial art doesn’t just look neat. Even better: It’s effective. I knew at that point it wasn’t going to be a summer time-killer. I wanted to learn it all. That was May 9, 2000. And though I’m in the best shape of my life and “tougher” than I’ve ever been, I’m still not a guy that you’d describe as “someone you wouldn’t want to come face-to-face with in a dark alley.” But now, after almost a decade training in self-defense, I have to ask, what on Earth are you doing hanging out in dark alleys? We are improving in Aikido — and enjoying it tremendously. We signed up our son first — he needed an activity and had just seen “Kung Fu Panda” — and quickly saw the wide-ranging benefits that come from training. He respects himself more as well as others; he’s proud of his advancing in rank and of the accomplishments of hard work and focus promotion entails; he knows numerous self-defense techniques that have led him to feel resourceful instead of hapless under threat of attack; and his body has grown stronger and more flexible. He says he loves Aikido for the reasons I’ve mentioned, and adds, “people should take Aikido because it makes you feel happier and safer when you’re walking around!” Seeing him realize these and other benefits, and how much fun he was having on the mats, his mom and I decided we’d give it a shot and we’re delighted we did. We now enjoy the benefits our son does, plus the added rewards that come from training together as a family. The principles of friendship and courtesy that constitute the basis of dojo etiquette carry over to our family life. We help each other with our techniques, support each other through the bumps and bruises, praise one another when we do well. Each of us has a framed certificate hanging in the hallway that marks our achievements of rank, and we work together to wash and fold our uniforms for training. Our schedules allow for us to train together Saturday mornings, which we usually follow-up with a big pancake brunch at IHop. We get to spend time together doing something we all enjoy and that makes us feel good, and along the way cultivate the kinds of bonds and connections that come from shared experience. Perhaps most importantly, we rest easier, especially with regard to our son, knowing that if the worst were to happen, each of us would have a better chance of being able to walk away from it. We’re not “The Incredibles” to be sure, but the “Fast Improvings” are having lots of fun learning the art of self-defense together. I have been intrigued by the martial arts for as long as I can remember. I grew up as the films of Bruce Lee, Chuck Norris and eventually Steven Seagal became mainstream. The control they displayed on screen, although totally scripted, was fascinating to me. Their fluid and powerful motion seemed as much of an art form as it did a display of physical prowess. I would find out much later in my life, that this interpretation was not far from the truth. As a young boy I was fairly small and easily intimidated by others of my age. I was convinced that the “tough” guys I saw on screen derived a great deal of that control I spoke of earlier from their physical stature. I often thought, if only I was that big, I could be that tough. But as my life progressed, I grew much taller but not much bigger. Instead of the martial arts, I was drawn to a physical endeavor which seemed better suited to my thin build — endurance athletics..
For many years, even though I still enjoyed films and television that featured the martial arts, I was just a spectator. My leisure time was instead filled with hours of grueling training in a never ending quest to go farther and faster than I had in the past. Race after race, and mile after mile, the quest continued. But life eventually caught up to me, and slowly but surely I reduced my pace. As I matured, I began to enjoy the simpler things in life. I had a family to treasure and a job I really enjoyed. Little by the little, my endurance goals disappeared. With the end of that obsession came the complacency, the obvious weight gain and all the other “joys” that go along with maturity. I realized over time that the only thing I really missed about endurance athletics was the feeling of being physically fit. So I decided to try and approach physical fitness from another angle and answer a life long question – could I be a martial artist? Along with this decision came a flood of doubts. Could I handle this new regimen with my older and much stiffer body? Could I overcome the fears of falling and hard impacts that grow with age? But most of all, I worried about learning something totally new at what some would consider an “advanced” age? In addition to my initial fears and concerns came the obvious question — what style do I pursue? Like most things in America, there were literally dozens of schools to pick from in my area. For some reason, I was drawn to fluid style of Aikido. Their seemingly effortless movement which subdue their opponents fascinated me. So I visited the local Aikido school and signed up. Finally, it was time to take the plunge! I would find out through the coming months that I had made the right decision with Aikido and was blessed with a local school which fit my needs perfectly. On the first day, my Sensei made me feel right at home and reassured me that I would be allowed to learn at my own pace. He highlighted the fact that there were no trophies adorning the walls of our school and no competitions to worry about. The people of this dojo trained for many different reasons, but seemingly missing from all their rationales was the apparent testosterone driven rage of some styles. I wish I could explain to you all the intrinsic benefits of this graceful yet powerful style, but like many things in life, Aikido must be experienced to be understood. It is not just about self-defense or physical fitness, and contrary to what some believe, for me it is not mystical or spiritual. It has simply become one of those rare things in life, where you can’t remember what your life was like before you started, and you hope you never have to stop. 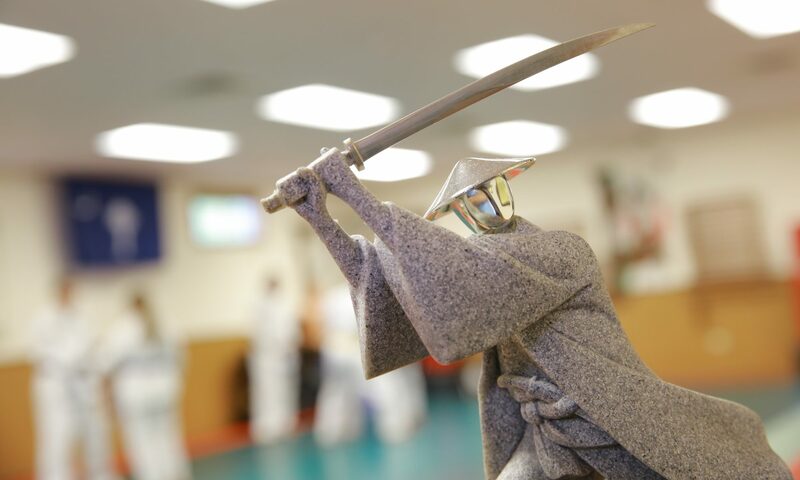 About five years ago, I decided to enroll my five year old son after visiting several local dojos. Our family had just relocated to Spartanburg, and my son was having a difficult time adjusting. Wyndham Academy gave him the confidence that he needed to adjust to our new surroundings, as well as self-defense skills that will last him a lifetime. Classes are very well structured, with numerous instructors that cannot be matched by any martial arts academies in the area. Sensei Wyndham is second to none in teaching approach, with kids, young adults and adult curriculum. My son has advanced six belts since he started, and had to work very hard to achieve success in Aikido. I firmly believe that this hard work and achievement will translate to the same success in life skills. If you are considering taking martial arts, I would invite anyone to visit all local academies, and then visit Wyndham Academy. The difference is remarkable, whether the training is for a child, young adult, or adult. We came to Wyndham Academy after our son had trained in Tae Kwon Do for 6 years and earned his Black Belt. He was looking for a new martial arts challenge. We came to observe an evening’s classes and we were most impressed by the structure and organization of the school and its classes, as well as by the art of Aikido. Mr.Wyndham is professional in his dealings with everyone who enters the school and genuine in his care and concern for the students and their families. The training itself is grounded in history, respect for self and others, and politeness. In learning the mechanics of self-defense, students also learn body awareness, coordination, and fitness. Safety is of utmost importance and techniques are not even practiced without consideration for the safety of all participants. Our son eagerly looks forward to every class, and thoroughly enjoys all aspects of Aikido. We are thrilled that a school of this caliber is available in our area!